According to Princess Cruises eighth annual Relaxation Report, we Americans aren’t getting any better at the fine art of relaxing. Of course Princess wants you to take notice that you need to rest and relax, and of course they want you to do it on a Princess Cruise, but the figures are always fascinating - and eye-opening. The complete story appeared in the August 11 edition of Cruise News Daily. Details appeared in the August 11 edition of Cruise News Daily. Azamara Club Cruises set their Cuban program for the fall and winter 2018/2019 season, and Royal Caribbean’s boutique brand seems to be setting themselves up as the go-to line for travelers that want to see a lot of Cuba. The island has almost become their entire Caribbean product. Their itineraries include multiple Cuban ports and/or long stays in Havana, and they’ve also announced new experiences ashore in Cuba. The complete story appeared in the August10 edition of Cruise News Daily. MV Werften began construction on Wednesday of their new shipbuilding hall at their Rostock yard. MV Werften is the collection of German shipyards purchased by Crystal Cruises’ parent to build the ships for the luxury line’s expansion into river cruising and their next generation of oceangoing ships. Details appeared in the August 10 edition of Cruise News Daily. Sometimes you just have to drive through the bad part of town to keep from going miles and miles out of your way. It’s no place you’d want to walk, but driving through, you’ll be ok as long as you just keep on going except for stop lights, and then keep your doors locked and chances are you’ll be just fine. If you want to, you can whistle or sing, if it makes you feel better. In the same way, cruise ships sometimes have to sail through bad parts of the world, among other threats, there are pirates. They aren’t the ones like you see in Disney movies, but these are bad guys, who chase down ships at sea, board them (by force), take them over and hold them and the people aboard for ransom. Recently it was necessary for Sea Princess to sail through the Indian Ocean where pirates are known to operate, and in this article CND takes a look a some of the precautions taken aboard the ship. The complete article appeared in the August 9 edition of Cruise News Daily. 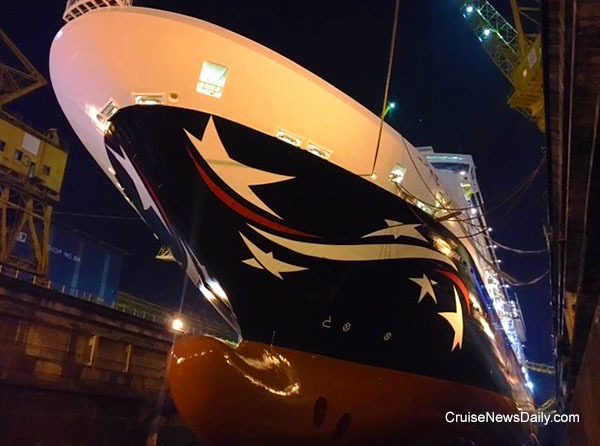 One of the most noticeable changes to Pacific Eden after her dry dock in Singapore is P&O Australia’s new Southern Cross livery. The photo below was taken just before they began flooding the dry dock this morning. She will emerge tomorrow morning and we can see it all. Photo courtesy of P&O Australia. All rights reserved. May not be copied or used without express permission. Passengers sailing aboard Carnival Paradise to Havana don’t have to wait until the ship arrives in Cuba to feel like they are in Cuba. Carnival has loaded up the sailings with Cuban-themed events to enjoy while sailing to the island nation. The complete story appeared in the August 8 edition of Cruise News Daily. Celebrity has named Nathaly Alban their first female captain in their Galapagos line-within-a-line. Captain Alban will be the master of the recently revitalized 100-passenger catamaran Celebrity Xploration. Details appeared in the August 8 edition of Cruise News Daily. In last week's conference call to discuss Royal Caribbean's second quarter earnings, a topic that came up several times was their price integrity program. Executives said it's working well, and that's evidenced in the strength of their bookings in all markets. That's excellent news for Royal Caribbean. Unfortunately for consumers' pocketbooks, though, it's really bad news because it means there are no longer those super sales to help fill up the ship. A 3-year-old girl was injured but very fortunate when she fell from her stateroom balcony aboard Carnival Breeze on Friday during a sea day in the Gulf of Mexico. Carnival did not provide any explanation of how the toddler got over the railing - either climbing or sat upon the rail by an adult - but she was fortunate that she fell onto an open deck only one level below. Tropical storm Franklin suddenly appeared headed for the Yucatan, but has only caused one ship to change course. Disney Magic assisted ten migrants in the Mediterranean and waited with them until the Italian Coast Guard came to assist.